In an attempt to find ourselves some new friends a few years ago, we started a wine club in our condo complex. Each month, our small group would pick a wine region or a theme and everyone would bring a bottle to share. The hosts that month would provide snacks either representative of the region or that would pair well with the chosen varietal. Foreshadowing our wine exploration of New Zealand and Australia, Dave and I chose to host a "Wine from Down Under" party. I started searching for traditional New Zealand and Aussie food that we could serve and came up short in my quest on websites, in food magazines and even browsing local pub menus. I can't recall what we served, but after being in this area of the world for almost two months, I can guarantee I fell down on the job representing the local fare. While much of the food in this area is similar to what we can find at home, there are some specialities that have peeked our curiosity. Lamb, lamb and more lamb Racks of lamb, legs of lamb and lamb roasts fill butcher counters and supermarket meat departments. The Sunday evening meal in Australian is a lamb roast and we've had the pleasure of being guests at two of them since we've been here. Lamb right out of the oven. Meat Pies and Sausage Rolls If chicken pot pie is an American heart-warming meal, than meat pies and sausage rolls are the Australian answer to this hearty meal. Bakeries and other small town stores have crusty pastries filled with meats, veggies and cheese on heated display. They are usually just a few dollars so an easy, cheap meal on the go. Dave has taken a particular liking to sausage rolls. Lets just hope they don't lead to other rolls. Kangaroo A somewhat controversial meat has entered supermarket shelves. Kangaroo meat can be found in all different cuts, even made into "kanger bangers" - kangaroo sausages. We tried a kanger banger and it was decent, but wouldn't be my choice of meat both because of the taste and also the visual impact of eating one of those cute little guys that you see bouncing along the fields. Kangaroo meat on display at the Adelaide Central Market. Beetroot A common addition to sandwiches and burgers is beetroot (what we would just call beets). You also see it served as a spread on cheese plates (and it's delicious). While we see beets at home in salads and as sides, they number of uses for beets in Australia (and New Zealand) definitely outweighs our normal repertoire. 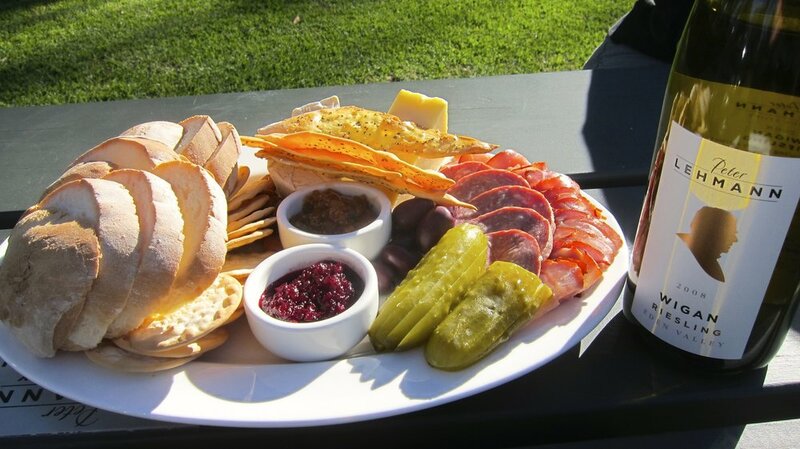 A cheese and meat platter at Peter Lehman winery. Magenta colored beetroot spread front and center. Desserts Our friends here had a list of Australian foods we needed to try and more than half of them were sweets. Anzac biscuits, vanilla slices, pavlova and lamingtons all made the list and we have tried them all. Pavlova - a meringue based dessert - sweet but tasty. I had a go at making the traditional Anzac biscuit because we love the oatmeal, toffee taste of a freshly baked dozen. The biscuits originated during World War I when women on the home front were looking for something to that wouldn't spoil when being sent overseas to their soldiers who were serving as part of the Australian and New Zealand Army Corp (ANZAC). The biscuits (or what we would call cookies) are widely available in supermarket bakeries, but the best are fresh out of the oven. See below for the recipe. Anzac biscuits made by the time-tested Country Women's Association recipe. We have yet to throw a shrimp on the barbie, but we still have time. Preheat oven to 180 C. Grease baking trays. Sift flour into a large bowl and mix in oats, sugar, coconut and salt. In a saucepan, combine boiling water with the butter and golden syrup. Bring to boil and add the bicarb soda. Add liquid to dry ingredients and mix well. Place spoonfuls of mixture on prepared trays and flatten with a floured fork (leave room for spreading). Bake for 10-15 minutes, until golden-brown. Remove from the trays before they harden.